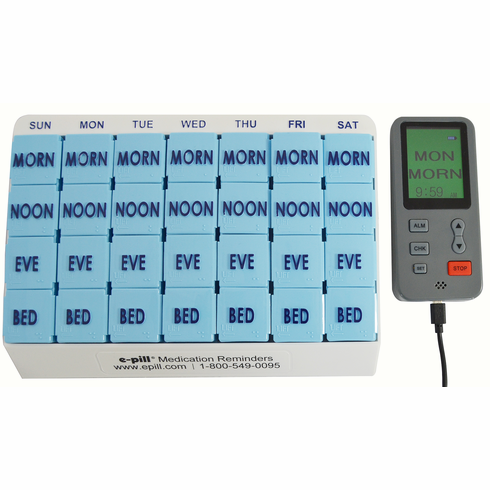 The e-pill MedGlider Weekly HOME PLUS Medication Manager Pill Box system will help organize your medications and remind you to take medication up to 4 times per day. How it works: When the alarm goes off, the device will beep and a message will flash on the screen telling you which pillbox to take. For Example: "TUES, BED" Simply press the red stop button twice to shut off the alarm. The alarm will automatically reset and go off at the same time tomorrow. If the red button is pushed once it will Snooze for 5 minutes. I am extremely pleased with the product! The alarm is loud enough to hear it several rooms away, which helps. We have finally been able to keep medications on time, which is critical for my husband's condition. A.C.
Color: Blue Pillboxes with White Tray. Timer is Grey.